You might have two comments from me. If so delete/ignore one of them. 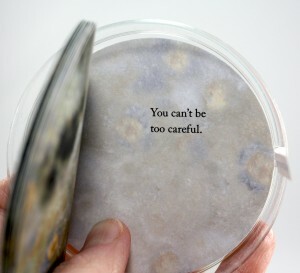 I love your Petri Dish Books. And I am sure I read somewhere that our obsession with GERMS means that we are more likely to catch grooblies because we don’t build up any immunity. 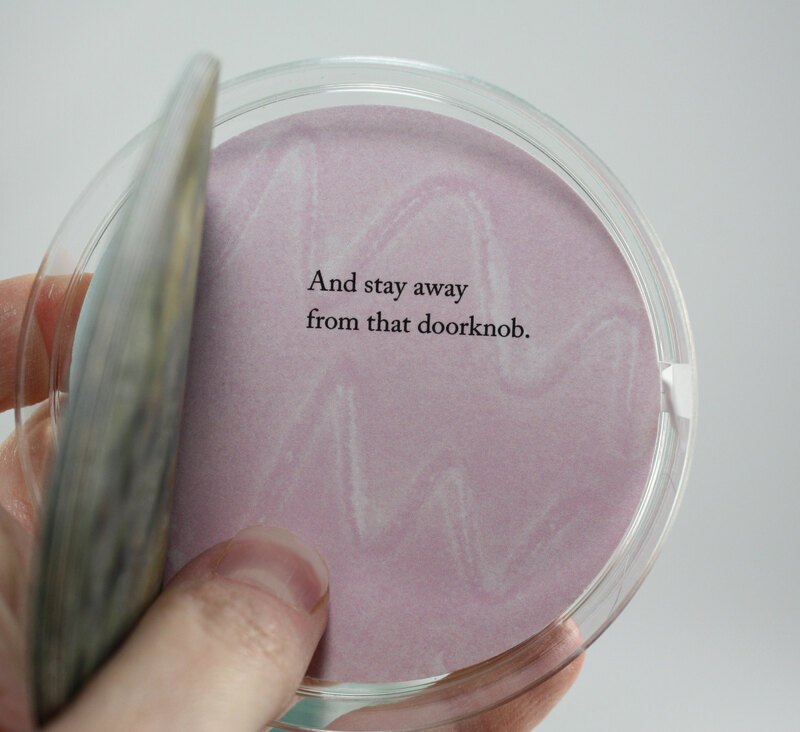 Here in Oz at the moment there is a very silly advertisement spruiking a wonderful disinfectant/hand cleaner which senses your hands so you don’t have to touch the applicator. If said disinfectant was any good I would expect it to cope with any grime picked up that way. Sigh. 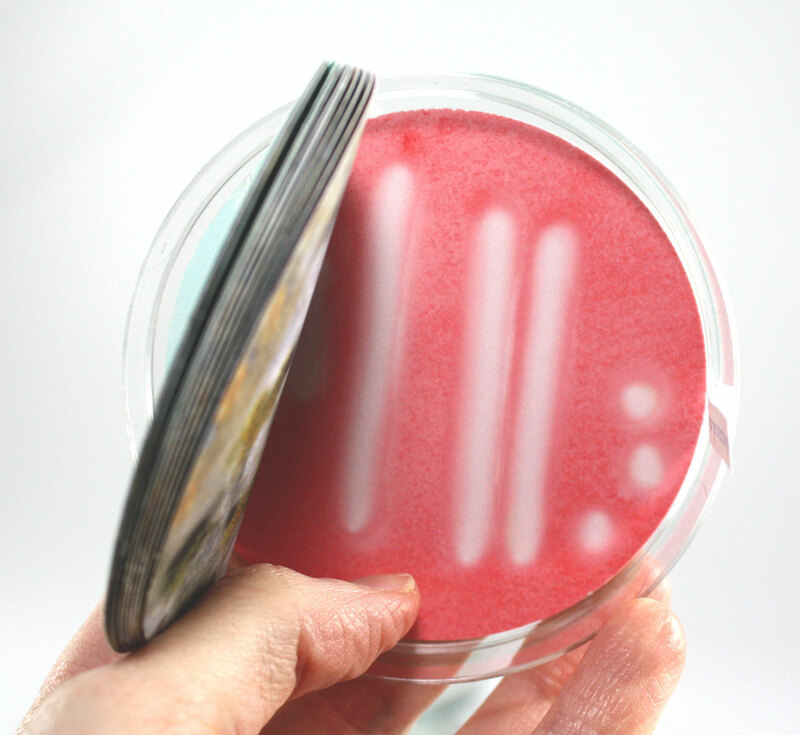 I love the idea of altering PETRI DISHES. I’m just starting down the altered book trail, but you’ve got me tempted to think outside of the box a little more. Just what I need to start collecting more goop that just might come in handy. I’ve already got a few too many of those free backs from the donated-to-the-library discards. You know, the ones that are way too good to REALLY cut up, and also will come in really handy once you (I) sit down and get real with the scanner any day now…. Some of those cultures you made, look like you marbled them. As a Photoshop nut, you’ve also got me thinking about some new effects to try for. If I ever just turn off all the other things I do, I could just sit and do nothing but filter in Photoshop all day and every day – and be perfectly happy. Thank you for being out here. P.S. Was I effusive enough? Greetings Laurel! Thanks so much for such a kind and inspiring message! Funny also that you should mention Photoshop filters. I’ve been obsessed lately with filters and textures! I love Photoshop! I don’t think I ever use it without learning something new–it’s just endless. That’s one of the things I love about it. 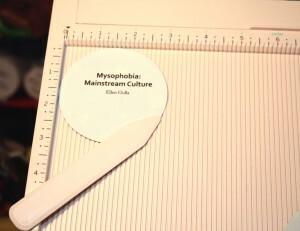 There was no marbling on the cultures. Most of them started off as paste paintings, then I added some undiluted acrylics on top, but I still wasn’t satisfied. So I scanned them and began playing around with layering textures, using brushes and cloning (mostly) on top of the scans. I think it’s the collagist in me–I just love manipulating stuff in Photoshop. I’m so delighted to meet you. Your comment was a real day brightener! Thanks. For a while, when we were travelling a lot, I carried a bottle of stuff in my bag and made my children use it a zillion times a day. And then, something made me remind myself that I’d become a person I didn’t want to be and I put the stuff away, and we don’t seem to be any more or less sick than we were before. I love these petri dish books. Hi Tracy–lovely to hear from you again. Thanks! I have to confess these books have a certain element of poking fun of myself. Because of my regular health problems, getting sick starts a chain reaction that long outlasts a cold. 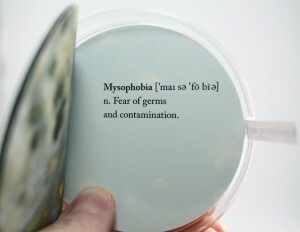 So there’s an extra bit of a germ phobic in me. But I find the over-the-top reactions people have, the slathering of disinfectant everywhere… I don’t have kids, but I’ve been told that many children here are expected to bring their own disinfectant wipes to school and to use them all the time–sometimes to the point of the kids having skin reactions from it. Disturbing. I really love these little books. How did you come upon the petri-dish idea? That really IS thinking outside of the box! I haven’t done paper arts in several years, and have a cabinet full of gorgeous and textured papers and collage elements. I’ll check around and see if I can subscirbe. Thanks! Thanks Spectra! 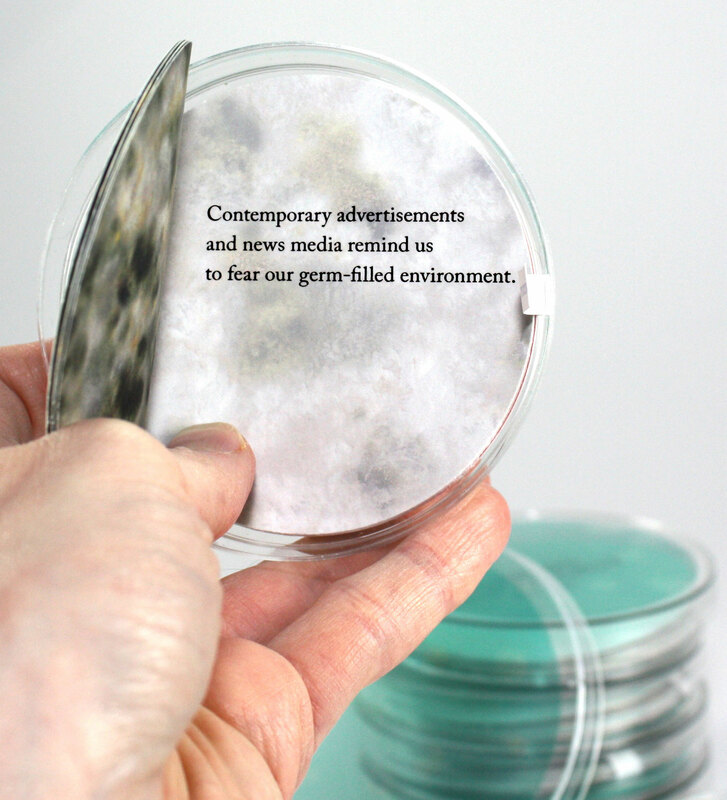 I got some petri dishes from a university bookstore a while back. At the time I thought I might put something in them that would look a bit culture-ish, maybe to make birthday “cards” or something. 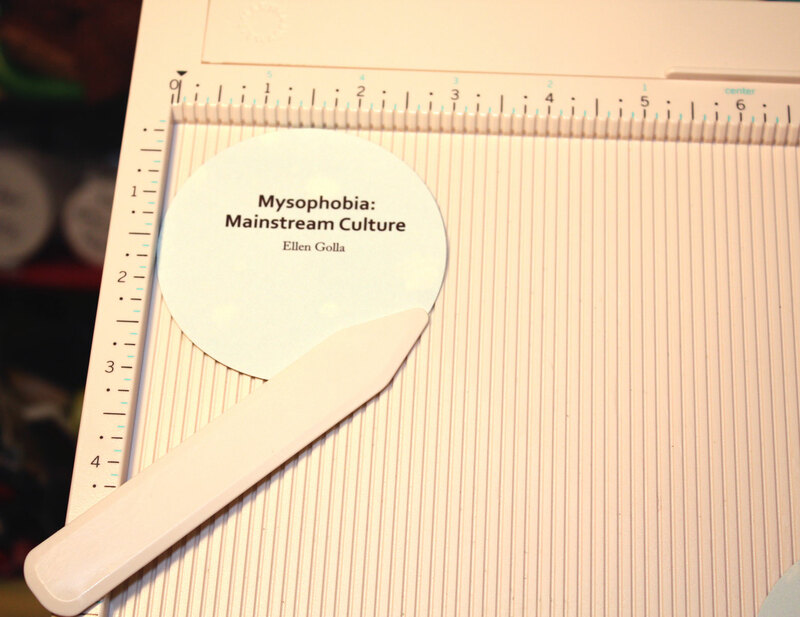 Later along it hit me that the “cultures” could be made of paper… and from there, a book! 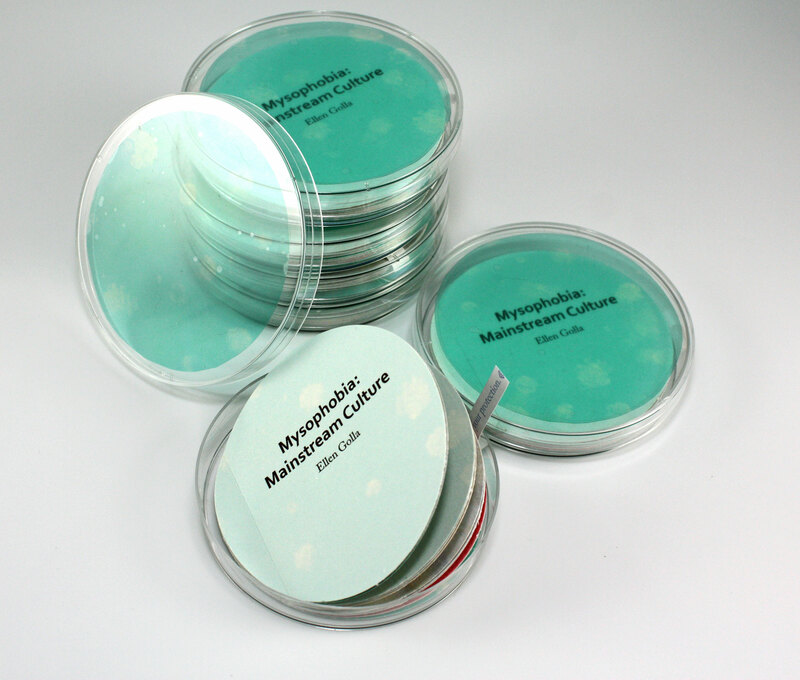 Then came the online hunt for more petri dishes. . . I hope you decide to play with your gorgeous and textured papers and collage goodies again. Definitely recommended. Thanks for subscribing!